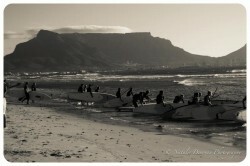 Boss Man’s note: South Africa has probably got one of the most underrated SUP racing scenes in the world. The country has a long history of success in surfing and paddling sports and scored the Team Bronze @ the ISA World SUP Champs in Peru back in February. The 3rd annual PRIMI Naish Downwind Dash Series has just kicked off and provides an awesome platform to take SUP racing to the next level in this part of the world. South Africa is already famed for its wind and water (it’s a bit of a kite-surfing mecca) so hopefully it can grow to rival the likes of Hawaii and Australia as a SUP downwind destination. The Downwind Dash SUP race series will be running each Wednesday for the next 20 weeks, right through until March. The first race was held last week, so check out the full race recap and results below. We’ll also keep you posted with weekly updates and leaderboard. Thanks to our new SUPracer.com columnist Peter Petersen for the great race recap below. Peter is going to keep us posted with results and pics from the entire 2012/2013 Downwind Dash Series, as well as everything else that’s happening in the South African SUP race scene. 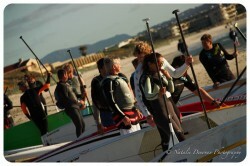 Peter’s also one of South Africa’s leading paddlers himself and is the founder of SUP Culture. All photos © Natalie Denovan. The PRIMI Naish Downwind Dash Series – now in its 3rd year, kicked off in style last Wednesday (10th October) in Table Bay, Cape Town. This was the first race out of 20 being held every Wednesday until March 2013. 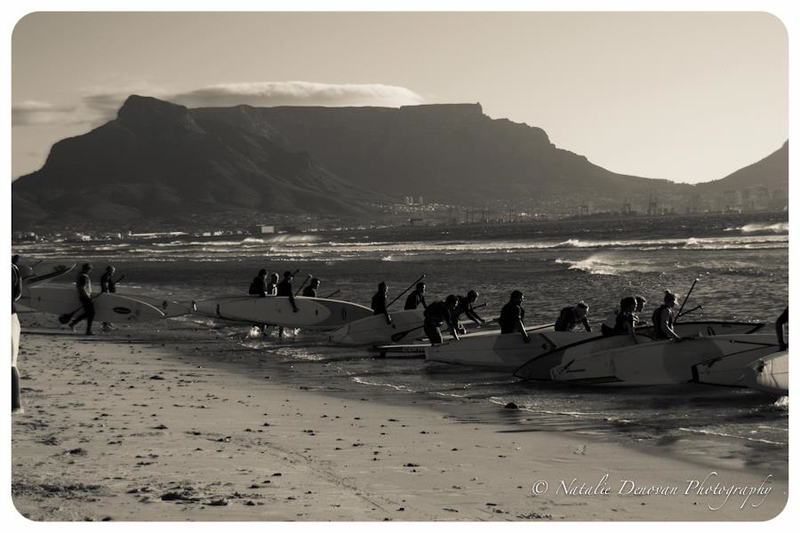 A record number of 47 SUPs and 29 surfskis took off into the sunset to take on the 10.1km perfect downwind run from Milnerton Lighthouse to Big Bay in Blouberg. Conditions were gentle, by Cape Town standards, with only 12-20 knots fanning the runners and a 1.5m swell making entry and exit very easy. No one had done a downwinder since May (except for 17 year old Dylan Frick, who spent 6 weeks in Hawaii over winter) so lot’s of cobwebs to be shaken off. Thankfully the South easterly wind had been blowing since Sunday and some paddlers had managed to get in at least one run during the week before the season opening race. This meant the race was pretty wide open as downwinding requires different set of skills and fitness compared to flatwater racing. 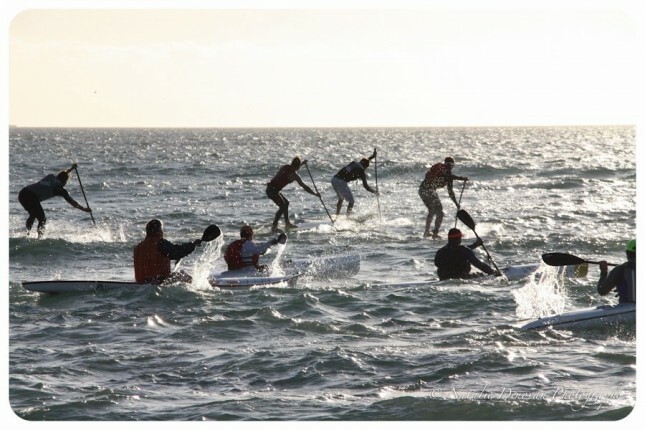 Some of the elite guys were quite nervous as no-one knew what to expect while the recreational paddlers were just amping to get on the water and feel the push of the swells. The first start at 5.50pm allows the entry level downwind paddlers a little more time to reach the finish before sunset while the 6pm start is for the faster more experienced group. It’s great watching the starts from the beach, seeing everyone scratching to get through the surf and immediately see the field spread out as the first runs are engaged. Ethan Koopmans (15 years old) took off in the first start together with Brigette van Aswegen to see if they could reach the finish before the faster guys caught up. In the second start Chris Bertish and Colin Heckroodt were first to the backline while Dylan Frick fell in and lost a good few places. Chris took off, but the pursuit team were not far behind and Dylan quickly managed to catch up and stay with him. Chris and Dylan took a semi-wide line, while Greg Bertish, Andrew Cillie, Pietro Muscas and Francois Frick went even wider. Matthew van der Lindenwas the furthest inside and also making good progress. Chris and Dylan looked like they left everyone behind exchanging the lead several times. Chris was battling to stay upright in the cross chop at times and would lose any advantage gained with every fall. Chris and Dylan ding-donged for the lead the entire way! The light winds produced plenty of runners, but being weaker, they are relatively short and you really had to work hard for every single one – fitness plays a big part here as several paddlers experienced came into the race in the second half of the run. At the entry to Small Bay only Ethan Koopmans from the first start group had managed to stay ahead of the elite guys and he managed to get line-honours and the Juniors win, much to the delight of his mom Jennifer Koopmans who is also our new official time-keeper together with Laurence Wollheim. Greg Bertish had made a dash from his very wide outside line but just fell short of catching Chris and Dylan so he had to settle for fine 3rd. In the final sprint Dylan Frick managed to keep Chris Bertish behind him to cross the line in 54:37 with Chris a mere 16 seconds behind. This was another great victory for young Dylan who has been winning pretty much everything of late. From there it was a couple of Masters (over 45 years old) in Andrew Cillie (4th) and Pietro Muscas (5th) who came in just ahead of young 17 year old Matthew van der Linden (6th). The first lady home was Brigette van Aswegen with quite some margin to 2nd placed Karina Figl. 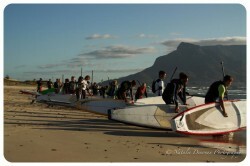 The third-placed female was young 15 year old Mishka Steyn on her very first downwinder. In the Juniors, Ethan Koopmans won with Josh Robertson in 2nd and Kimon dos Santos in 3rd – these guys were pretty close and they will have great battles in the next couple of races for sure. There are nine more races to be held in this first half of the series and we look forward to more exciting racing in even stronger winds in the weeks to come! Thanks to Big Bay Lifesaving Club, our Timekeeping Team: Jenn and Lolo and our sponsors PRIMI, Naish, BulkSMS, SUPHQ, Vitaminwater, Xpression on the Beach, Coreban, Buchulife, Swox, Watersports Warehouse.